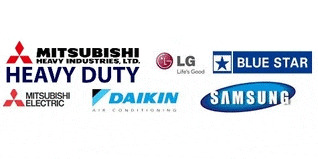 COOLING CARE DEALER MITSUBISHI ELEC. VRFVariable Refrigerant Flow (VRF) Systems—City Multi 9910885865-7210185865 Mitsubishi Electric's VRF air conditioning systems offer the luxury of distributed airflow and the independent control of indoor units. Installation flexibility and a wide selection of indoor unit designs and outdoor unit capacities ensure "best match" solutions for air conditioning needs, even for the most diversified requirements. Consideration for the environment during development has led to the manufacture of powerful, compact units that consume minimal energy, have a high coefficient of performance (COP) and contribute to maximum room comfort. Carrier vrf in Guru gram 09910885865 The all new side discharge Carrier VRF air conditioner lineup lets you cool or warm as many rooms with a single system. Outdoor units ranging from 4 to 12 HP, offer best in class energy savings, installation flexibility and quiet operation, plus with many indoors to choose from, the side discharge Carrier VRF makes a perfect solution for showrooms and office buildings. MITSUBISHI INVERTER TECHNOLOGY AC DEALER COOLING CARE 9910885865-7210185865 QUICK AND POWERFUL Increasing the compressor motor speed by controlling the operational frequency ensures a powerful output on start-up. It brings the room temperature to a comfortable level faster than units unequipped with an inverter. Hot rooms are cooled, and cold rooms are heated faster and more efficiently. Carrier vrf in delhi 9910885865 The all new side discharge Carrier VRF air conditioner lineup lets you cool or warm as many rooms with a single system. Outdoor units ranging from 4 to 12 HP, offer best in class energy savings, installation flexibility and quiet operation, plus with many indoors to choose from, the side discharge Carrier VRF makes a perfect solution for showrooms and office buildings.